Rocket: Ready for Lift Off!! Based out of Los Angeles, Rocket will be competing in this year’s Battle for Vans Warped Tour. Composed of lead singer Janelle Barreto, guitarist Eric Wibbelsmann, bassist Bill Luna and drummer Paul Despatie; Rocket channels hard rock influenced by Soundgarden, Jane’s Addiction, Joan Jett, Stone Temple Pilots and many more. Starting as a band called The Pills, Eric, Bill and Paul had lost their singer and were searching for someone to fill the spot. 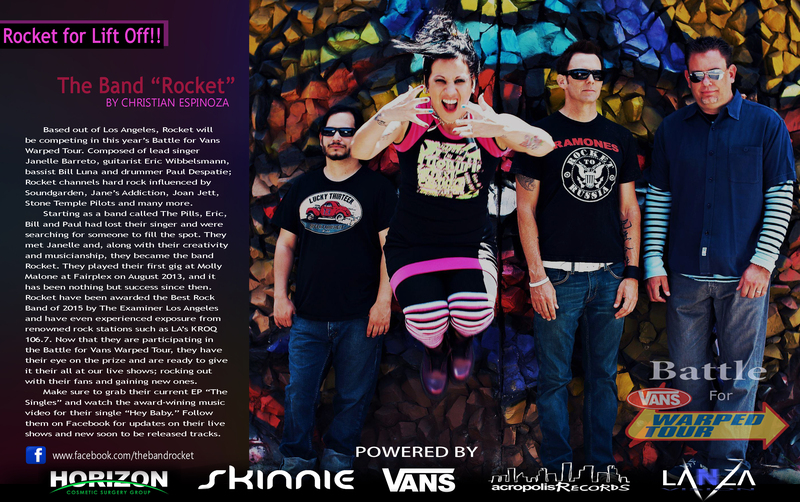 They met Janelle and, along with their creativity and musicianship, they became the band Rocket. They played their first gig at Molly Malone at Fairplex on August 2013, and it has been nothing but success since then. Rocket have been awarded the Best Rock Band of 2015 by The Examiner Los Angeles and have even experienced exposure from renowned rock stations such as LA’s KROQ 106.7. Now that they are participating in the Battle for Vans Warped Tour, they have their eye on the prize and are ready to give it their all at our live shows; rocking out with their fans and gaining new ones. Make sure to grab their current EP “The Singles” and watch the award-wining music video for their single “Hey Baby.” Follow them on Facebook for updates on their live shows and new soon to be released tracks.